I am a 25 year old mother to three little girls; Elaina, Abigail and Zoe. My husband and I met at Mardi Gras on a missions trip through church and got married 8 months later. In 2008 he became a licensed pastor and he just started a worship band (I’m so proud!). As a stay-at-home mom (SAHM) I began to feel pretty worthless, like I wasn’t doing anything with my life except wiping bottoms and following kids around with a vacuum. So I began Creations By Chara on Etsy and then most recently a review and giveaway blog. 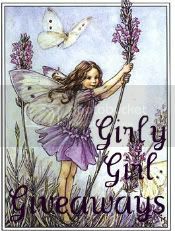 Girly Girl Giveaways started January 2, 2010! Yes, that’s right! My blog is only 4 months old. I have already accumulated an amazing following of loyal readers whom I love to shower with all sorts of fun giveaways. I have been blogging for a few years. Aside from Girly Girl Giveaways I have a personal blog called When Does Daddy Come Home?! I started that original blog in January 2008. My sister told me she had a blog and I really didn’t know what it was. We had just gotten a computer with Internet for the first time since Daniel and I got married. Once I saw her blog I said, “I have to do this!” I’ve been writing my whole life. It just seemed like the natural thing to do. Oh man what don’t I feature?! Mainly I focus on women and young girls and babies. I am a breastfeeding, baby-wearing Momma of a 6-month-old so I also look for products that serve pregnant women and new mothers. I will also be starting a Girly Girl Gift Guide series starting with Father’s Day so Dads can get it on some giveaway action too! I love organic, natural products. I really and truly love companies that serve a cause as well. They usually donate proceeds to a charity or their entire business is based around charity. Other things I feature include small businesses (ETSY), jewelry, lotions, clothes, chocolates, beauty products, baby toys, etc. I am really excited about one that is coming up for Misikko.com. Someone is going to win a PINK FLAT IRON! My blog mainly appeals to mothers and young women, though due to the diversity in products reviewed and given away anyone can find something! Wow, I have to be honest that I haven’t really thought about where to go from here. I think that in the future I definitely want to expand into being more of a “host” to blog parties and organizing online events. I really hope to reach 1000 followers by the time my blog is a year old. Time. I didn’t realize how incredibly time consuming product reviews and giveaways are. You have to contact companies, organize your events and giveaways, email (and then email some more), write the posts, check entries, correspond even more with companies… it is seriously like a full time job! And I usually do it with a nursing baby on my lap and usually typing with one hand. So that has been my biggest challenge most definitely. The freedom to post what I want to post. I love getting to express myself. I was a very private, closed person before I started a blog. I feel my blog has helped me blossom into a more extroverted and confident person. I have a few pet peeves, naturally. One of them is entrants who do not read the rules or follow them. I never know if it was purposeful or accidental. I want people to win… but in honesty. Just remember to follow the rules for mandatory and extra entries. I hate deleting entries that don’t comply! Giveaways are simple to enter; just by leaving comments on the blog. If anyone has questions on exactly how to do that (and I have been asked before; don’t feel stupid) send me a message! Get yourself a little calendar and keep it by your computer and spreadsheets will become your new best friend. Don’t get in over your head and remember to HAVE FUN. If you start to feel overwhelmed or stressed spread your giveaways out more. Also promote, promote, promote. Join blog networking sites and blog parties. Get yourself exposed or your blog will get lost in the huge pool of other giveaway sites. I am off to visit, thanks for the introduction…..